You can feather (soften or blur the edges of) a selection in Photoshop Elements 11 by setting the Feather radius before you create your selection. A problem may arise with feathering before you make your selection, if later you want to modify your initial selection. When you make a selection with a feather, the selection border adjusts to take into account the amount of the feather. So, the resulting marquee outline doesn’t resemble your precise mouse movement. As a result, modifying, adding, or subtracting from your original selection is difficult. 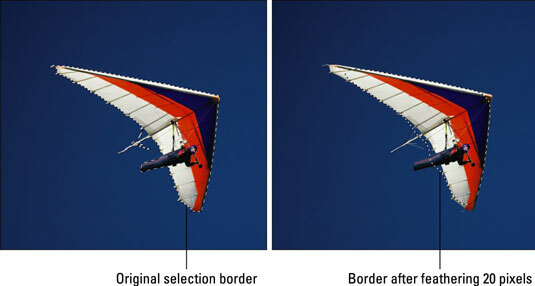 A much better way to feather a selection is to make your initial selection without a feather, as shown in the left image. Clean up your selection as necessary and then apply your feather by choosing Select→Feather. In the dialog box, enter a radius value from 0.2 to 250 pixels and click OK. The resulting selection appears in the image on the right. The radius is how far out in all directions the feather extends. A radius of 8 means that the feather extends 8 pixels inward and outward from the selection outline. A large feather radius makes the image appear to fade out. The Refine Edge command, which appears right after Feather on the Select menu, enables you to fine-tune selection edges by using various options.